The problem is that space for storing spent fuel on-site at nuclear power plants in Taiwan is running out. When space does run out, two operating nuclear power plants will be forced to shut down or be decommissioned early. This is not the first time that Taipower has faced this dilemma, they have played a shell game with the accumulating spent fuel assemblies as they have slowly responded by constructing last-minute additional storage facilities as potential shutdowns loomed. After installing high density storage racks at spent fuel pools, the only other option was increasing on-site storage in dry casks. In 2005, before the Chinshan nuclear power plant completed its on-site storage facility, the Unit 1 spent fuel pool was expected to be full in 2011. The licensee submitted a construction license in March 2007, and started construction in November 2010. The storage problems for Chinshan also required additional attention in 2012 when the AEC found that unless spent fuel was transferred to dry cask storage the Unit 1 spent fuel pool would reach full capacity by 2014. According to the latest estimates released by the Atomic Energy Council in Taiwan, the spent fuel pools of both reactors at the Chinshan nuclear power plant and the Kousheng nuclear power plant will reach full capacity by 2016, but this time on-site storage will also be unable to alleviate the problem. In light of the issues, Taipower announced that it is prepared to spend at least $356 million USD to have 1,200 spent fuel assemblies shipped overseas in the next four years in groups of 300 assemblies, reprocessed, and sold by the reprocessing facility operators. The remaining wastes not sold would be stored at the reprocessing plant for 20 years and then shipped back to Taiwan. 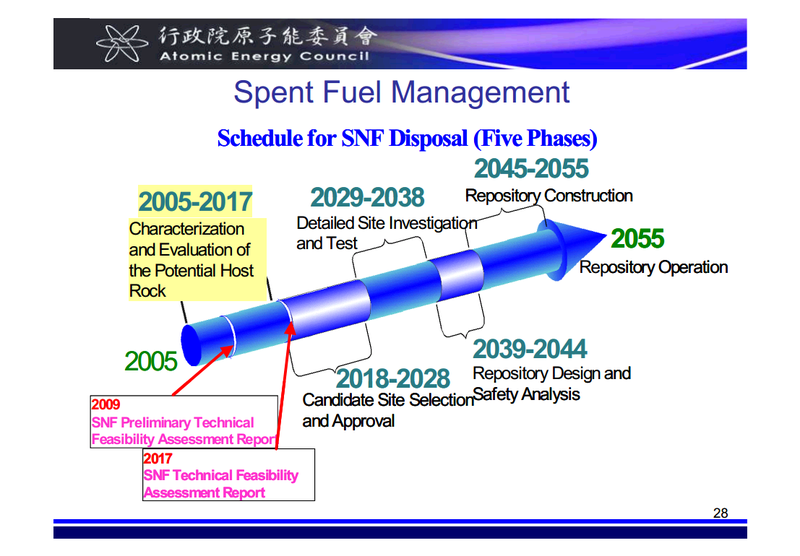 Reprocessing spent nuclear fuel was not the first option explored by the Taiwanese government. They previously explored methods of shipping the nuclear waste internationally for permanent storage, however a plan to store waste in a North Korean coal mine were dropped after protests from South Korea and Japan – and there would be obvious political ramifications to storing nuclear waste in China or Russia. According to Taiwan’s current regulatory framework, the licensee (Taipower) is primarily responsible for the management and storage of spent fuel generated at nuclear power plants. Taipower has known that the estimated storage capacity at its two operating nuclear facilities has been exceeded for some time, but Taiwan has no interim or permanent storage repository that would allow the nuclear waste to be stored in-country. Taipower may see it easier to deal with the waste by reprocessing it in the short term as opposed to trying to get public approval for the construction of intermediate additional on-site or centralized spent fuel storage facility. In Taiwan, the public perception of the safety of nuclear power has changed considerably after the Fukushima Daiichi nuclear disaster in Japan. Taiwan, like Japan, is prone to earthquake activity. Many citizens in Taiwan have protested the plan to reprocess the spent nuclear fuel and see it as unnecessary considering the fact that Taiwan has determined not to build any more nuclear power plants and has established a national goal of going nuclear free. The protestors feel that the government’s push to reprocess the spent fuel overseas is only intended to extend the operation of plants which could be shut down if no alternatives are discovered. The Taiwanese government secretly built the Lanyu nuclear waste storage facility off the southeastern coast on Lanyu Island, known to some as Orchid Island, in 1982 to receive various shipments of low level radioactive waste from nuclear power facilities. Local residents were told that the government was building a canned fish factory and only after the fact found out in 1987 that it was in fact a nuclear waste storage facility holding 100,000 barrels of nuclear waste. In 1996, due to the protest of local residents, the last shipment of 146 drums of waste meant for storage at the Lanyu site was forced to return to the Chinshan nuclear power plant. No radioactive waste has been shipped to the Lanyu facility since then on. [iv] The government has promised citizens that the wastes would be removed from the Lanyu, but there is no readily available site to store them at. There is also a future storage problem with accumulating drums of low level waste at Taiwanese nuclear power plants. According to the Atomic Energy Council, the total amount of LLW at nuclear sites was 203,189 drums as of December 2012 — the national storage capacity is 340,000 drums of LLW.